UnitedHealth Group Inc. (UNH): Could Obamacare Impact Its Earnings? Earnings season has been a mixed bag for the market’s biggest stocks so far, with some major companies reporting stellar results while others have endured the wrath of disappointed investors. UnitedHealth Group Inc. (NYSE:UNH) had the chance to make its own mark today by chalking up a success in its first reported quarter of the year. 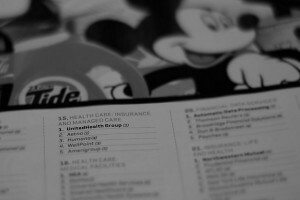 Let’s see just how America’s biggest health insurer fared. Analysts had expected the company’s profit to fall from a year ago. Earnings projections averaged an estimate of $1.14 per share going into today. Wall Street walked away satisfied, then, as UnitedHealth topped those estimates with earnings of $1.16 for the quarter. That’s still a significant fall from last year’s quarter, when the company produced earnings of $1.31 per share, and total net profit declined to $1.2 billion from $1.4 billion a year ago. On a brighter note, however, the firm’s revenue jumped by more than 10%, rising to $30.3 billion from $27.3 billion. UnitedHealth Group Inc. (NYSE:UNH)’s membership push helped the top line grow, as the company recorded 1.1 million new members in the quarter and raised its total membership to 42 million individuals. In an industry where size matters, UnitedHealth has done a standout job of pulling in solid growth while firming up its position atop the insurance industry. By comparison, rival Humana Inc (NYSE:HUM) only counted around 12 million total individuals under its total medical membership back in November, while Aetna Inc. (NYSE:AET), also one of the largest insurers in the country, recorded 22 million in its medical membership even after its purchase of Coventry last year. Unfortunately, investors haven’t been so happy with UnitedHealth Group Inc. (NYSE:UNH)’s earnings decline, even though the company’s bottom line topped analyst projections. Shares of the insurer have plummeted more than 3.3% in early trading. Part of that negativity is due to UnitedHealth’s downbeat expectations for the rest of the year, as the company announced it expects less revenue over the full year in 2013 — projecting $122 billion in revenue overall, down from earlier estimates of between $123 billion and $124 billion. A major company client moved into a self-funded format, a move that Unitedhealth says will negatively impact its top line. Analysts expect $123.8 billion in full-year revenue and $5.51 in earnings per share, so UnitedHealth’s gloom could be setting investors up for disappointment. UnitedHealth Group Inc. (NYSE:UNH) expects full-year earnings that could easily miss analyst projections as well, projecting between $5.25 and $5.50 per-share earnings in 2013. Rising prices from medical services and doctors’ operations have added to the company’s costs, and health care reform has forced the firm to provide more services in order to comply with the legislation.